Former French president Francois Hollande, who is under fire for Reliance's funding of his partner's film production, has said that Ambani owes him no favours because it was the Indian government that proposed the company's name. The sale to India by France of 36 Dassault Rafale jet fighters, signed during the presidency of François Hollande, is at the centre of a growing scandal in India where opposition parliamentarians have demanded a detailed investigation of the deal, alleging favouritism, mismanagement of public funds, the endangering of national security. 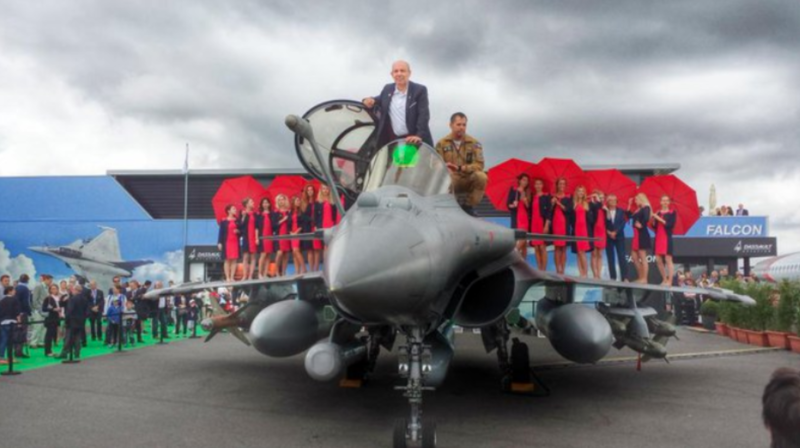 They are notably suspicious of the circumstances by which India’s Reliance Group was assigned as Dassault’s partner in the building of the jets. 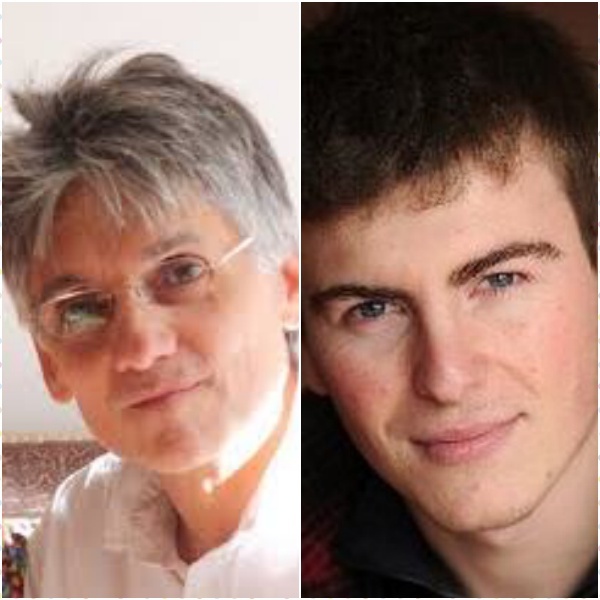 As Karl Laske and Antton Rouget report here, at the very time the deal was struck, Reliance provided funding for a film produced by Hollande’s partner, the actress Julie Gayet. “One day, the Indians came and the film could be made,” remembered one of the production team of the film Tout là-haut, co-produced in 2016 by the actress Julie Gayet, the partner of then French president François Hollande. Tout là-haut (English title, ‘To the top’), tells the story of Marco Siffredi, played in the film by Kev Adams, who died on the slopes of Mount Everest while descending on a snowboard. The film’s budget was 10 million euros, and the Indian funding – initially to be 3 million euros but later reduced to 1.6 million euros – was a lifeline. 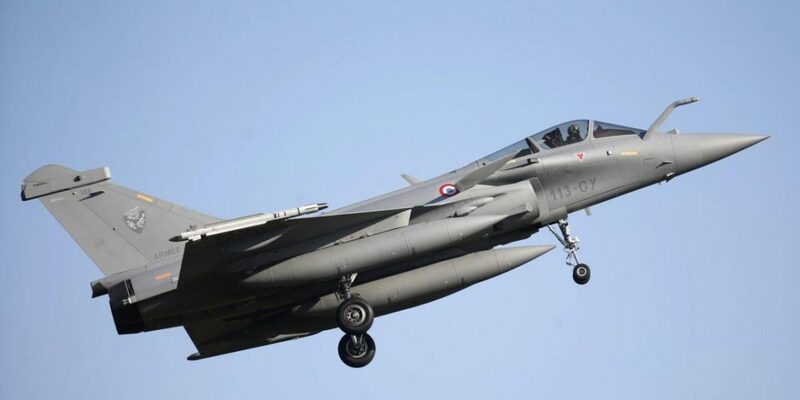 The Rafale sale has since become steeped in controversy in India, with allegations of corruption surrounding both the price of the aircraft and also the role of the Reliance Group. On Thursday this week, members of the opposition Congress party met with the national Indian audit office, the Comptroller and Auditor General of India (CAG), to demand an investigation into the deal, alleging favouritism, mismanagement of public funds, the endangering of national security and the contravention by Dassault of market regulations. The Congress party also accuses Indian Prime Minister Narendra Modi of favouritism by allegedly ensuring that the compensation agreement would benefit Ambani’s Reliance Group. The party said its defence arm, Reliance Defence Limited, had no experience in building fighter aircraft and was created just 12 days before the announcement by Modi, on April 10, 2015 during a visit to Paris, that the deal for the Rafales had been struck. At the time, the involvement of an Indian company with cinema logistical experience came as no surprise, assisting with the shooting in mountainous terrain. On January 24, 2016, Anil Ambani released a statement announcing his group had agreed a French-Indian partnership with producers Julie Gayet, of Rouge International and Elisa Soussan of My Family which manages Kev Adams. The announcement was made on the same day that the then French president François Hollande, Gayet’s personal partner, arrived in New Delhi on a three-day visit to India. 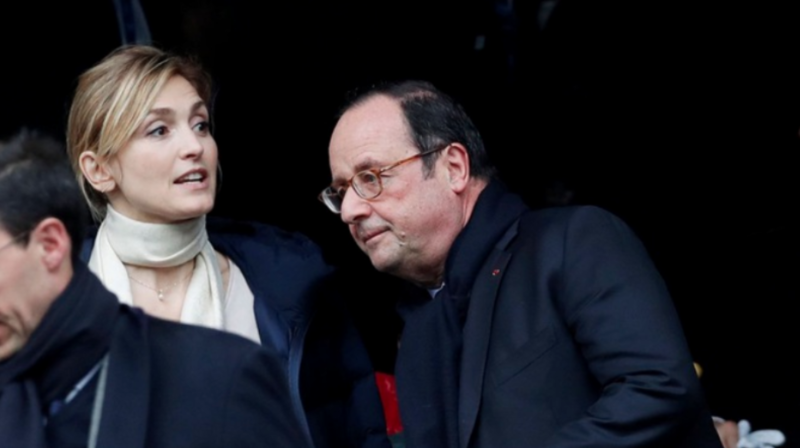 Contacted by Mediapart, François Hollande said he was “not at all informed” about the film production deal with Ambani’s group, and he added that he knew “nothing” about the Reliance Group. Hollande’s visit to India in January 2016 centred around the sale of the Rafale jets in what would be an important third contract after sales deals with Egypt and Qatar. On January 25th 2016, the day after Hollande arrived in New Delhi, Prime Minister Narendra Modi announced an “inter-governmental agreement” had been reached to purchase the aircraft. The producer Elisa Soussan did not reply to Mediapart’s request for an interview. In a statement passed on via Julie Gayet, My Family said it was on Soussan’s “initiative alone that she convinced reliance to invest in the film”. Reliance appeared on the film credits, but was not mentioned in the financing details supplied to France’s public body for the production and promotion of cinema, the Centre national du cinema (CNC). Indeed, the funds from Reliance were handed to the film through Visvires Capital, an investment fund with offices in Paris and Singapore and which had already provided services for Anil Ambani. “Reliance Capital, for example, invested with us in the wine domain in India, one of our two activities along with the funding of films,” said Visvires founder Ravi Viswanathan, a French former banker of Indian origin. Viswanathan knows Anil Ambani personally, having been introduced to him 25 years ago by French banker and businessman Matthieu Pigasse. “Since then we’ve done things together, with Lazard and Reliance, when I was a banker,” added Viswanathan. Just what was the interest for Reliance in the film, which was not distributed in India – the country is not even mentioned – remains uncertain. 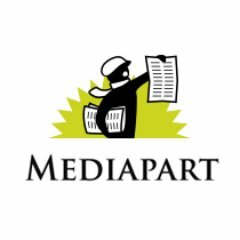 Contacted by Mediapart, the group did not respond. “We asked them if the scenario interested them,” said Ravi Viswanathan. “They read the scenario and they said ‘yes’.” He said that Reliance was asked whether it would be interested in part funding the film “because we think the films of Kev Adams have in the past worked well in France”. In November 2016, the Intelligence Online newsletter, which has well established sources in the defence industry, mentioned Viswanathan presence in Ambani’s entourage and also that Reliance was to help fund Julie Gayet’s next film. At the time, the shooting of Tout là-haut had only just begun. It was initially planned for cinema release in march 2017, but that was later postponed to December 2017. Meanwhile, given the scope of the questions filed by the opposition parliamentarians in India to the Comptroller and Auditor General of India, the Dassault-Ambani controversy is likely to develop much further. One of the principal issues they raise is the cancelling by Narendra Modi, who became prime minister in May 2014, of an initial public tender. The previous Indian government had opened the way for the purchase of 126 Rafale jets and a working agreement between Dassault Aviation and the Indian state- owned aerospace and defence corporation Hindustan Aeronautics Limited under which 70% or 108 of the aircraft would be built in India. But Modi, visiting Hollande in Paris on April 10th 2015, announced the 7.5 billion-euro deal for 36 jets built in France. The Indian opposition says Modi should not have made the announcement before renewing tenders for the supply of fighter aircraft from Dassault’s competitors. Meanwhile, the initial price of the Rafale fighters had risen by 300% from when the very first negotiations began, while the consequences for Hindustan Aeronautics have been catastrophic. “There is a serious industrial risk for Dassault because we’re dealing with a company that has never built an aircraft and which has never been involved in defence,” commented a French analyst in defence issues, whose name is withheld. The defence arm of the Reliance Group was registered just 12 days before Modi’s announcement in Paris, while another of the group’s subsidiaries, Reliance Aerostructure Ltd, was created 14 days after the announcement. In September 2016, the then French defence minister Jean-Yves Le Drian and his Indian opposite number Manohar Parrikar validated the inter-governmental agreement. 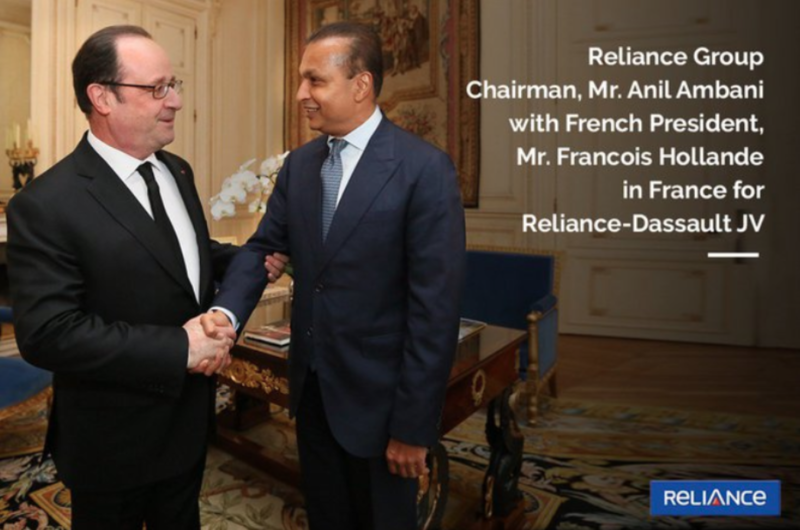 The then French president François Hollande met with Anil Ambani in Paris in February 2017 after talks between the latter and Le Drian. 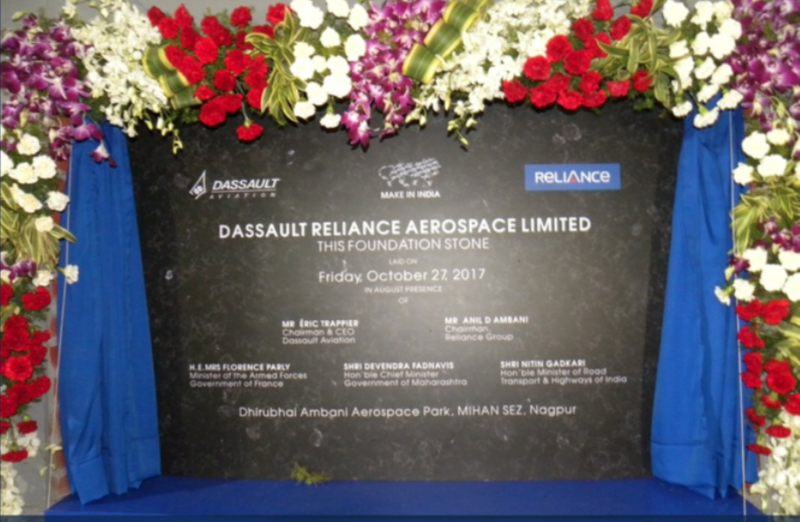 Following the election of Emmanuel Macron as French president in May 2017, the Rafale dossier was passed to new defence minister Florence Parly, who travelled to India last October to inaugurate one of the sites of the Dassault Reliance Aerospace Limited (DRAL) joint ventures, at the Ambani Aerospace Park in Mihan, when it was announced that 100 million euros was invested in the building of parts for the Rafale. Translated by Graham Tearse from the French original ‘François Hollande, his partner’s film, and the French fighter jet sale to India’, Mediapart, September 21, 2018. This story has been republished exclusively with permission from Mediapart. The original French version can be read here.